The Allegheny Front Trail, a relatively new trail in western Centre County, was built collaboratively in the late 1990s by Penn State Outing Club, Ridge & Valley Outings Club, Quehanna Area Trails Club and the Keystone Trails Association. The trail provides a wide variety of forest environments, including views over valleys to the east, trout streams, and marshlands. The orange-blazed trail surrounds Black Moshannon State Park and crosses PA 504 twice, though there is almost no road walking. Since its inception, the Allegheny Front Trail has changed very little, except for the addition of bog bridges through Black Moshannon Swamp upstream from Shirk Road. Scattered along the trail are six trout streams; an acid-polluted stream of interest to activists, known as “Red” Moshannon Creek; and various small brooks. 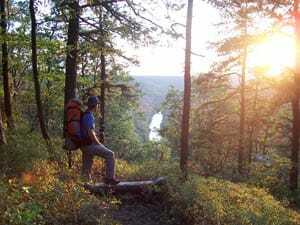 The trail includes about 3 miles on the edge of the Allegheny Front, with six identified vistas and some areas of nearly continuous views; extensive portions of the Ridge and Valley Province to the southeast are visible. Hiking is very rocky and steep along this portion of the trail, though you are rewarded with some of the finest overlooks in all of Pennsylvania. You can easily find water on most of the Allegheny Front Trail even during droughts, but there is one 6-mile-long dry section from Smays Run to the headwaters of Benner Run. The works of beavers are easily seen on the southwest and northeast sections. Shorter loop hikes of 26 miles (on the eastern portion) and 20 miles (on the western portion) are possible by walking through Black Moshannon State Park via the blue-blazed Shingle Mill Trail along Black Moshannon Creek, and then the park’s orange-blazed Moss Hanne Trail. In the state park, camping is permitted only at the official campground. The book Greate Buffaloe Swamp, which contained trail descriptions plus history, is out of print. The original publisher, Quehanna Area Trails Club, is now defunct and George Lockey is deceased. The trail descriptions have been put into a new book, Foot Trails of the Moshannon and Southern Elk State Forests, which can be ordered from Amazon or from the web site of Scott Adams, the publisher.